If you’re planning to host a scavenger hunt party for kids we’ve got everything you need to get started right here! 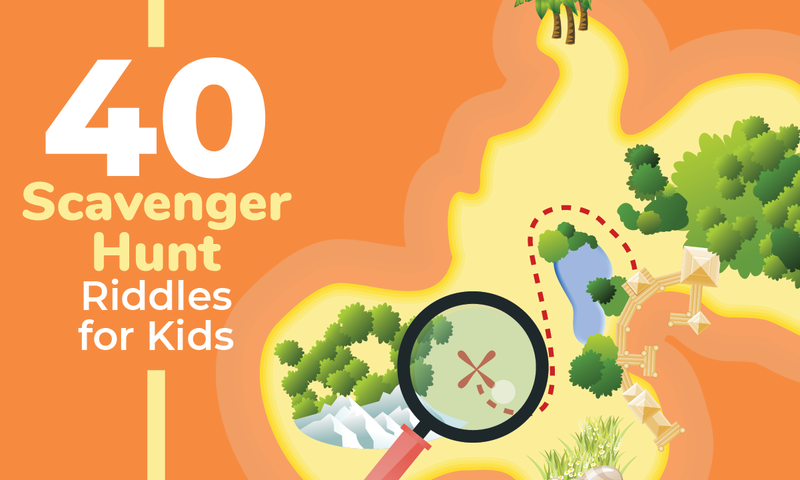 With a list of 40 scavenger hunt riddles for kids, you can host a scavenger hunt or a treasure hunt anytime you want. Host an Easter scavenger hunt with riddles, a birthday party scavenger hunt, or any holiday scavenger hunt you want. Host an outdoor scavenger hunt for kids or an indoor scavenger hunt for kids. We will show you how to make a riddle scavenger hunt for kids we will show you how to make a find things treasure hunt with a list of things of treasure hunt things to find. We even include prize ideas for a scavenger hunt and snack ideas for a scavenger hunt. A scavenger hunt, sometimes known as a treasure hunt can be played indoors or out. You can chase the scavenger hunt riddles or collect objects along the way and win a prize at the end of the hunt. Scavenger hunt riddles for kids can be fun at any birthday party where the clues lead to prizes or a treasure for all the guests to pick through at the end. Consider making the guest of honor work for his/her present by scattering clues throughout the house leading to the gifts. Holiday scavenger hunt riddles can be fun when it comes to finding gifts and prizes; perhaps the kids would love some Easter scavenger hunt riddles leading to their baskets. Plastic eggs make fun places to hide the clues. Hosting a scavenger hunt party for kids is a lot of fun and is not as difficult as you may think. Kids and adults alike enjoy the excitement and thrill of finding each clue. This is a great way to put a twist on a party or event, and although it might take a little time to initially create the scavenger hunt, the end results are worth the time and effort put into setting it up. If this is the first time you’ve hosted a scavenger hunt party, you might be wondering how to get started. No need for worry because we’ve got you covered. We’ve got everything you will need to get started; from 40 scavenger hunt riddles for kids to scavenger hunt items that can be found, we even include simple rules and things to consider when hosting your party. It’s simple to create a scavenger hunt for kids. The first thing you will need to think about is the theme of the party. If it’s a themed birthday party, you might want to incorporate your treasure hunt riddles into the theme. You can make the end prize something that goes with the theme, but one big hit at the end of a scavenger hunt for kids is a treasure chest filled with prizes they can pick through. Once you’ve decided what kind of party you are hosting you will need a list of treasure hunt clues. Rhyming treasure hunt riddles work well, and they will make the kids think before setting out to find the next clue. The kids can search for the clues on their own or as a team, it will depend on the size of the party and the kind of scavenger hunt you’re playing. Remember, the guest of honor alone might be hunting for the presents. The guests should be handed the first clue to get them started and then from there the hunt will begin. When you prepare your invitations be sure and include any special instructions for this party. If it’s going to be an outdoor scavenger hunt the kids should wear play clothes just in case there is dirt involved in the hunt. They might require special shoes or other necessities, so think it through before completing the invitations. The following is a list of indoor scavenger hunt riddles for kids followed by another list of outdoor scavenger hunt riddles for kids. These lists have been created as a foundation to help you get started, you can print the clues out, tweak them to fit into your theme, or you can even add to them if you want to. Scavenger hunt riddles strategically placed before the game begins. Each clue should lead to the next. #1. I have four legs but no feet. When you get tired, have a seat. #2. Things go inside me when dirty but come out clean. You will find me standing sturdy next to my mate. #3. This flat box houses color and sound. In the living room, it can be found. #4. Turn out the light and rest your head on me tonight. #5. You use me after playing in the dirt. If I get in your eyes it might hurt. #6. I’m extremely humble as I make your clothes tumble. #7. Open me to use me, close me when you’re through. Look in your room for the next clue. inside you will find a frozen treat. #9. I will keep your books safe in my pack. Zip me up before slinging me on your back. you will see your complexion. #11. For the movie, you shall pop some corn. When it’s ready the buzzer will warn. the adults can drink a lot. after I pop, bring on the spread. with buttons galore to provide some sound. #15. All your answers are inside this box. With Google, sometimes it talks. #16. Dishes go in dirty but come out clean. It can be white, black, and maybe even green. #17. When you’re covered in dirt I will give you a squirt. Stand in the tub and rub-a-dub-dub. #18. You have one, probably more, each with a knob and even a lock. When company comes you will hear a knock, knock. #19. Inside here you will find coats and shoes. Keep it organized so you know whose are whose. But no matter what, it’s time to get up. welcoming you at the door. when it rains I’m sure to get drowned. #4. They grow up tall but could be small. They smell so pleasant and make a good present. #5. This is a house that’s built for a car. Sometimes it’s where the lawn tools are. spin me around and I will cool you off. I could pop if I hit a hole. #8. Hot dogs, hamburgers, chicken, and more. On here you’ll find plenty of food galore. but I prefer that you use me for some shade. you’ll see that the inside needs a good sweep. kicking your feet some height you will gain. on this, we can have a picnic. when the wind blows I will wave to you. but I’m used to cool tons on the inside. #15. With two wheels I’ll gladly roll, taking you where you want to go. Not too fast, but rather slow, we don’t want to hit a pole. with two in the front, you can see where to go. #17. I can be flat, but usually, round, some like to paint me and some like to throw me around. Find the shrubs in the front and pick me up off the ground. I’ll make the porch seem so bright. although I’m outside, I will keep you safe at night. I can run with electric, but I prefer gas. This is a simple and fun treasure hunt idea to consider when playing with younger kids. It can be played in two ways; one where you simply find everything on the list and return it to home base within a certain amount of time, or two, the players can be asked to snap a picture or selfie with the item and the location where it was found. This can be played using riddles to find the items or simply hand out a list of items to find. No matter which way you choose to play, this scavenger hunt will be a big hit. We have included a list of treasure hunt items to help you get started and they can be found either indoors or out. You can customize the list to fit your needs according to the size of your group and the ages of your kids. Take each item and turn it into a riddle if you prefer, but no matter how you play you should be sure and set a time limit and set up boundaries to keep the game fair and everyone safe. Before turning the kids loose to hunt for their clues you will want to consider a few additional things to make this a safe and positive experience for everyone. Ages are Important- If you’re hosting a party with children of all ages, you might consider pairing up a younger one with an older one. If you have a large group, split them up into two teams with mixed ages on both sides to make it fair and easier for everyone. Proper Clothing is Important- As we mentioned earlier, when hosting an outdoor scavenger hunt you will want to be sure all the kids are dressed appropriately. Not only should they be dressed in play clothes but consider the weather and the time of year. The summertime brings heat exhaustion and insects galore. Cooler days will mean no insects, but warmer clothing will be required. Be sure the kids are wearing proper shoes for the terrain they will be following. Proper Explanation of the Rules is Important- Keep in mind that scavenger hunts and treasure hunts can be played in different ways, so if someone tells you they’ve played before, that doesn’t mean they played the way you have planned. You will also need to keep in mind the ages of the kids; smaller kids will need more direction than the older ones. Be sure the rules are clear before sending them off with their scavenger hunt riddles, because once they scatter it will be hard to pause for further explanation of the rules. Use Pictures for Smaller Kids- When playing with kids who are too young to read, you can prepare pictures of the items they need to look for as opposed to handing them a word list. Not only will this help them along when they can’t read, but it will help strengthen their picture recognition and it will build their matching skills. Safety First- No matter what activity you’re involved in, safety should always be the first priority. It doesn’t matter if you’re planning to do a scavenger hunt around the house or if you will be in a park with unfamiliar territory, you will want to investigate the areas in which the hunt will take place. Check for any potential hazards; things like cords from lamps in the house that pose a trip hazard or a hole outside that they can fall into are important things to look for. In the warm months, be sure and check the areas outside for ant hills, mosquitoes, bees, and any other nasty creatures they might run into. It’s always important to host the scavenger hunt in a well-lit area, and never allow the kids to run through the neighborhood unsupervised or in the dark. Setting boundaries are important for safety no matter where the scavenger hunt takes place. Prizes and Snacks are Important- Don’t forget that you’re hosting a party or special event, so with that in mind you need to provide prizes and snacks to all your guests. Obviously, you will need to furnish gifts for the scavenger hunt, so think about providing a treasure chest full of prizes at the end of the hunt. If you’re hosting a church event or a school party, stuff the chest full of useful things they can use such as pencils, notepads, or bottles of bubbles for smaller kids. For an Easter scavenger hunt you can put a treat in each plastic egg they find along with a new clue. Of course, you will want to be sure and feed your guests too, so consider some tasty summer snacks that kids love or maybe some fall and winter snacks for your holiday party. Now that you have read through this guide and you have 40 scavenger hunt riddles for kids along with the additional list of items they can find, you can start planning that next important event in your child’s life. Just don’t forget to be safe while having fun!